Having a weed-free rice field is ideal, but not at the expense of nature. IRRI, through the Closing Rice Yield Gaps in Asia with Reduced Environmental Footprints (CORIGAP) project, continues to do cutting-edge research to boost rice productivity while safeguarding environmental health. According to Molly Shuman-Goodier, a CORIGAP-supported PhD student from the Northern Arizona University, amphibians species, such as frogs, contribute a number of beneficial ecosystem services to wetlands and irrigated rice fields. However, the application of herbicides like butchalor, which is used extensively in rice fields in Southeast Asia, affect the amphibians’ reproductive and developmental cycles. “We would like to find out whether the application of the herbicide affect the growth and thyroid physiology of the cane toads, at what stage it is mostly affected, and to test the degree to which tadpoles can acclimatize to sub-lethal herbicide exposure,” Molly says. 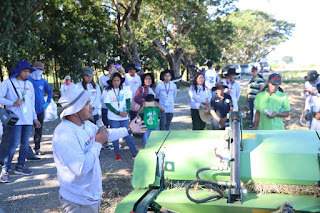 The Philippine Rice Research Institute (PhilRice), Philippine Carabao Center (PCC), and IRRI conducted a rice straw baler demonstration at the PhilRice Central Experiment Station in Muñoz, Nueva Ecija for the project “Development of Sustainable Rice Straw Management Practices and Technologies for Bioenergy, Food, and Feed in the Philippines”, or RiceStrawPH. 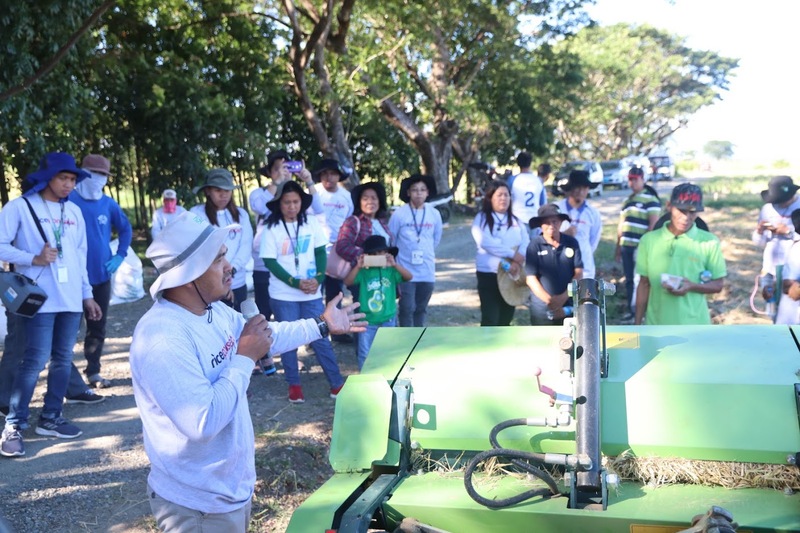 The RiceStrawPH project aims to develop and provide alternative uses of rice straw in order to add value to the rice byproduct, instead of farmers simply burning them. “We are looking for ways where Filipinos can enhance their livelihoods through innovative uses of rice straw, like mushroom growing and ruminant feed.” said Dr. Caesar Tado of PhilRice, one of the project leaders. “In the Philippines, we have legislation that prohibits the burning of rice straw, and Nueva Ecija also has a local ordinance that discourages this practice. This helped the Philippines significantly decrease rice straw burning incidence from more than 90% in the early 2000s, to around 30% in 2017.” he added. IRRI continues to develop and promote practices that increase benefits for smallholder farmers while improving the environmental sustainability of rice production. 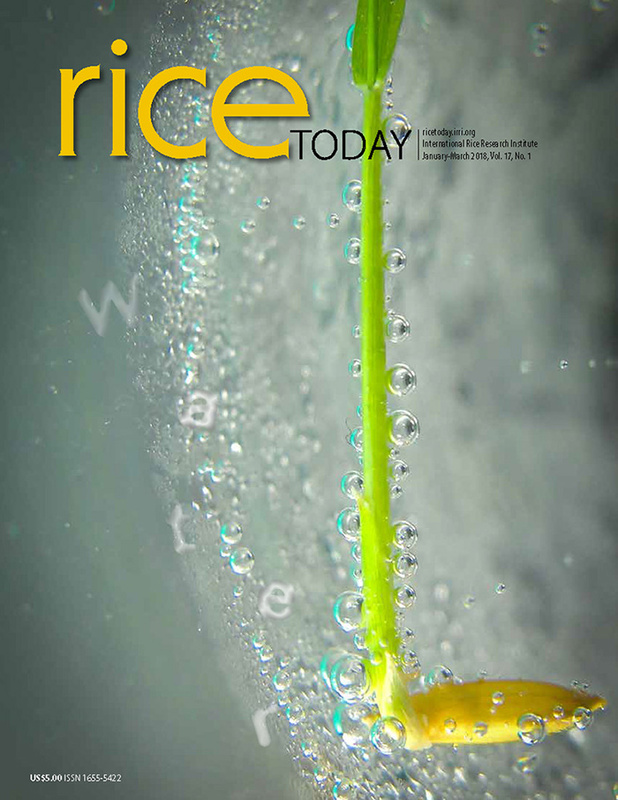 As rice production in the Mekong Delta faces challenges to economic and environmental sustainability, a group of scientists and extension specialists from IRRI and the Department of Agriculture and Rural Development of Can Tho assessed different rice crop management practices in Mekong Delta, Vietnam, based on farm-level performance indicators of the Sustainable Rice Platform. At the 5th Philippine Rice Information System (PRISM) convention, the Philippine Department of Agriculture (DA) Secretary Manny Piñol, through a message read by his representative Assistant Secretary Andrew Villacorta, highlighted the government’s aim to provide affordable food for the people by investing in research and development of modern technologies. In Sec. Piñol’s keynote message, he stated “An information system on rice is a big step for us to achieve our goal of rice food security accompanied by enhancing the industry’s competitiveness.” He acknowledged PRISM for providing the agriculture department with timely information on rice areas, production, yield estimate and other factors affecting it, and for helping regional field offices in enhancing their capability in ground data collection, data management, geographic information systems, and other relevant skills. Forging partnerships with the private sector opens up opportunities to maximize our research-for-development impact. 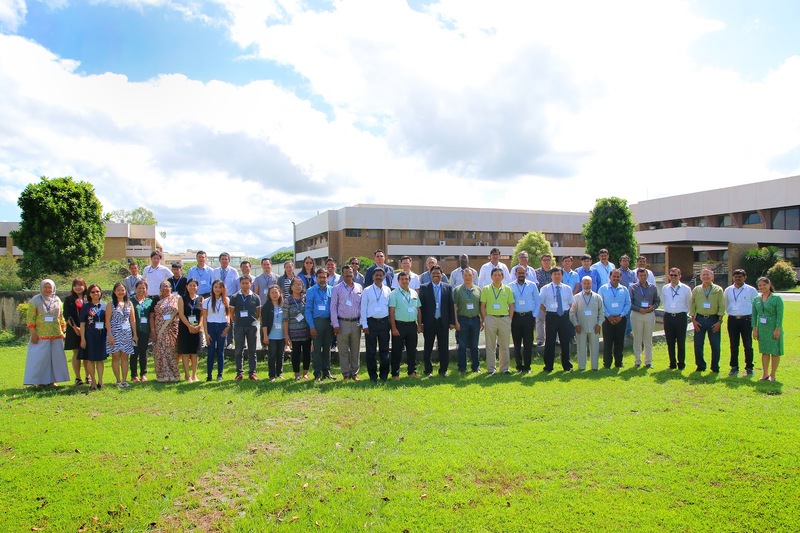 IRRI, through the Hybrid Rice Development Consortium (HRDC), facilitates a collaboration that would advance hybrid rice development and dissemination for smallholder rice farmers in Asia. Thirty-nine HRDC members gathered at IRRI Headquarters, Los Baños, Laguna earlier this week to discuss achievements and plans to improve hybrid rice research and sharing in the following year. “This year, we were able to develop new populations and parental lines for breeding, new hybrids for testing, and new DNA markers for forward breeding,” says Dr. Jauhar Ali, IRRI senior scientist and HRDC Coordinator. “These advances generated more resources and opportunities that enabled HRDC members to develop high-performing varieties,” he adds. As Vietnam rapidly progresses towards sustainable rice production, there is an increasing need for the rice sector, such as farmers’ organizations, exporters, food companies, research institutes, and other development oriented groups, to work together for the common vision of the country in becoming a global supplier of sustainable rice. Since standards for sustainable rice management practices are taking shape in the country, IRRI plays a crucial role in facilitating the implementation of best management practices through “1 Must Do, 5 Reductions” principles (1M5R: use high quality seed while reducing seed rate; water, fertilizer and pesticide use; post harvest losses). The best management practices are implemented in eight provinces in the Mekong Delta via the World Bank-funded project “Vietnam – Sustainable Agricultural Transformation” (VnSAT). In the VnSAT project, IRRI uses a multi-stakeholder Learning Alliance (LA) to critically reflect and plan for activities that will help incentivize the adoption of sustainable rice practices like 1M5R. 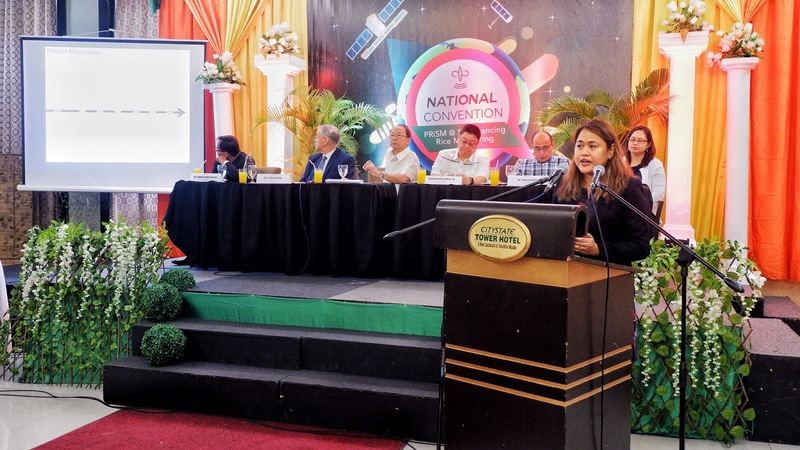 The LA aims to create supportive alliances for farmer groups for them to be able to engage better in the rice value chain, and to adopt and manage the demands of producing marketable rice. 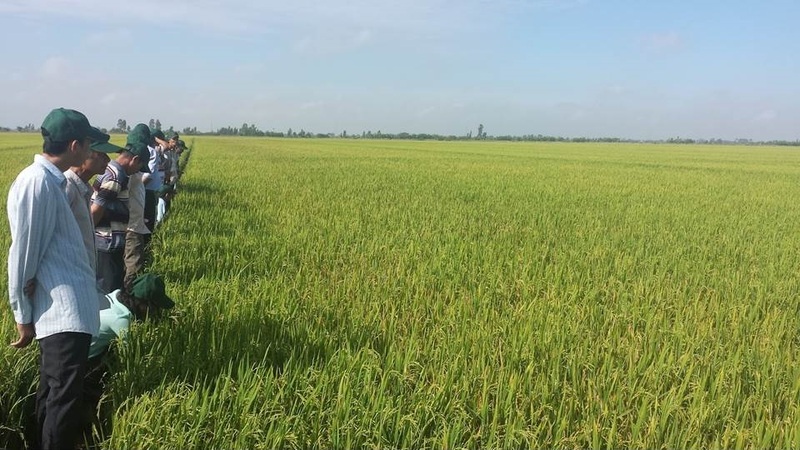 In order to do so, a series of LA meetings and activities are conducted so different stakeholders can assess problems and create solutions that help realize the country’s vision for their rice sector.